Summer is officially here! Which means we're trying (not that hard, I might add) to find a new routine and settle into it. This generally means getting me and the Kiddo out of the house on a daily basis to enjoy the summer sun while doing something remotely active, because you know, being parked in front of the TV all day playing Xbox really isn't my idea of a great summer (regardless of what the Kiddo thinks!). Not to mention that it has hit me again that the Kiddo is getting older and I need to enjoy as much of the kiddie stuff as I can before he outgrows it all and before it's no longer cool to hang out with your mom so much. That said, we've done absolutely nothing these past two weeks, even though I've been insisting to my family that we need to go out and "make some memories!". I'm pretty sure the Kiddo appreciates the more relaxed pace, though, and not having to do any writing assignments!! I'm enjoying slowing life down just a smidge too, and it's not like we haven't been doing anything. We've enjoyed Canada Day celebrations, attended free concerts and the Pride parade; we've met up with friends for play dates, knit dates, and Pokémon Go raid battle dates; we've spent time at the public library, time by the harbour, and time at the park...and there's still over seven weeks of summer left to go! Woah! I'm only looking forward to the cooler months solely for knitting purposes. For now, I'm savouring the warmer weather. Which is rare. Cause I never savour warm weather. Warm weather and I just do not mesh well together. For some reason, this summer is different. I'm not sure why. I was hoping to get a lot of sewing accomplished this summer but alas, my hopes were dashed when it was discovered (in a not so fun and stinky way) that the majority of the electrical outlets in half of my house need to be replaced. On top of the other handful of maintenance work that needs to be done. I live in a tiny townhouse and so having all of my sewing stuff out just isn't feasible. Ugh. Knitting it is then. Lots and lots of knitting. I'm currently working on three pairs of socks and just a few days ago I had cast on the most wonderful shawl, which you can see a little of in the photo above. This morning a box of yarn arrived on my doorstep and it's taking every fibre of my being to not cast on the blanket I've purchased the yarn for (pun, totally intended!!). Or the slippers that I've been eyeing since last winter...which there was also yarn for in that aforementioned box. Or to cast on one of the many new skeins of yarn that I've added to my stash recently...that's not part of that arrived this morning box. So.mucgh.yarn. We won't go there today. 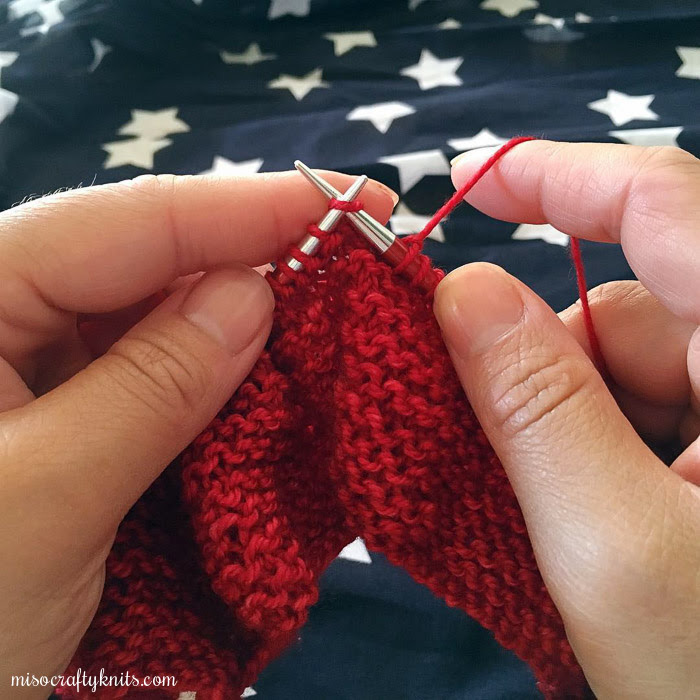 While the feelings of casting on all the knits are pretty strong, the feelings of finishing a few WIPs are equally strong, too. I just need to stop looking at pretty pictures of yarn and all the beautiful snapshots of knits on social media, cause my willpower is weak. It would also probably help if I actually sat down and took the time to do some knitting too...instead of looking at pretty pictures of yarn and all the beautiful snapshots of knits on soc...oh wait. Ok, I'm going to close all my browsers and settle down with some knitting. I hope you get the chance to do some knitting today too!